Rapper Mason "Ma$e" Betha had success in the 90s mostly guesting on recordings produced by Sean "Puffy" Combs. After he had three top ten hits from his 1997 debut album Harlem World, he seemed to be conflicted about music. He keeps retiring and then he returns. He was born Aug. 27, 1975 in Jacksonville, FL but he grew up in Harlem in New York City. As a teen, he got into trouble. So his mom sent him back to Florida. Betha returned to New York at age 15 and that's when he got into rap. Mason attended SUNY in Westchester on a basketball scholarship. But he left after two semesters to pursue a music career. His big break came when his manager took him to a rap convention in Atlanta. Betha auditioned for Combs and signed with Bad Boy Entertainment. Before he recorded Harlem World, Betha appeared with The Notorious B.I.G. on the 112 single Only You. He also appeared on the Puff Daddy album No Way Out. Then he recorded Harlem World produced by Combs and members of his production team The Hitmen. After the death of The Notorious B.I.G, Combs had big plans for Betha. There were three top ten hits from Harlem World. What You Want was the second single. It reached #6 on the Billboard Hot 100. It featured the popular girl group Total. There were so many guest singers on this album it made it look like Betha was the guest artist. What You Want was produced by Nashiem Myrick of The Hitmen. It samples the Curtis Mayfield song Right In For The Darkness. Harlem World was certified 4XPlatinum. After Betha's 1999 album Double Up didn't do nearly as well, he promptly retired from music with plans to become a minister. Of course he returned with the 2004 album Welcome Back. It did OK but I guess many fans had forgotten about him. Betha started hanging around with 50 Cent who wanted him to join his group G-Unit. But Combs wouldn't let Betha out of his Bad Boy contract. He retired again but he returned in 2009 as a guest rapper. He did that for a while and again tried to get out of his Bad Boy contract. When that didn't happen, Betha retired again in 2010. Of course he returned again and a new CD Now We Even will be released in December. This will get him out of his Bad Boy contract. I just find it hard to believe that after 20 years that music fans remember Ma$e. He was a big deal in 1997. Not anymore. 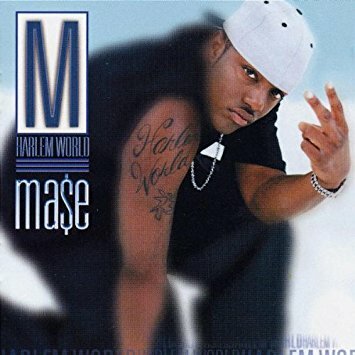 Here's the video for What You Want by Ma$e featuring Total.